Amsterdam’s cosy, cobblestone streets quiet down under the haze of late afternoon sunsets. Twinkling lights hang from above to mark the way for cyclists while canal side homes warm up, illuminated in soft, orange light. Seeking creative inspiration during my least favorite time of year, I headed out with my camera for a trek along the rounding canals and twisting streets of the Jordaan. Here, I found solstice in the blue, purple and orange lights that begin to blanket our city. When the cold and rain are somewhat at bay, it’s actually quite nice (or at least tolerable) to wander the little streets, inhale the fresh, crisp air and catch a glimpse of the canals reflecting like glass… before quickly heading inside to thaw my fingers around a warm glass of hot chocolate. Surviving the frozen season is a mental struggle, with endless grey days and a severe drop in temperature so this time, I’m trying better to embrace the unique aspects of the winter season. Forcing myself outside this time of year was a challenge—I set out with an intention to embrace this time of year (instead of just counting down the days to my sunny escape back home) and find some creativity in what I find an otherwise very uninspiring season. I captured these scenes during an afternoon stroll through the Jordaan as we made our way to Cafe Thijssen, a local favorite, for a round of zatte and bitterballen. While shooting content for a new project, I made my way through Vondelpark towards Amsterdam’s affluent Oud Zuid neighborhood on an autumn afternoon. Akin to Amsterdam’s Central Park, our beloved Vondelpark is typically associated with the lush, green days of summer. However, this time of year, I was lucky to catch some of the last remaining, bold colored autumn leaves in during the quiet moment just before a rain storm arrived, forcing us back indoors. Autumn inspires it’s own unique revival, as nature - and life - slow down in preparation for a season of hibernation, reflection and growth for the coming year. I still can’t believe we’ve already reached December and winter will surely be settling in soon enough. Join the conversation and visit this post on Instagram. 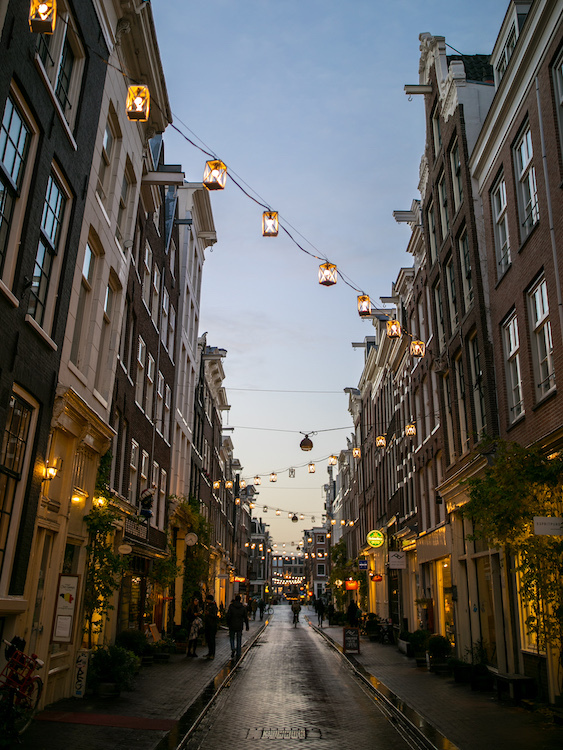 Along with our love for cycling, Amsterdam is also a perfect city to explore by foot. On Saturdays, I like to stroll down the block my neighborhood flower stand and pick up a fresh bouquet. This particular Saturday was October 27, what would have been my sweet Granny’s 101st birthday. Every year, we would order my grandmother a beautiful birthday bouquet filled to the brim with bright berries, autumn leaves and flowers in a rich autumnal palette, her favorite. She passed away last year and when her 100th birthday arrived without her, I was heartbroken… yet still inspired to continue our tradition. It still stings knowing that I can’t share the life I’ve built here in Amsterdam with her but I’ll continue to celebrate her life with a flourishing bouquet that I know she would have loved. This year’s bouquet dried beautifully with ever fragrant eucalyptus so, I kept it a while longer. As the flowers withered, new textures and colors emerged, inspiring me to create. It’s our nature to resist aging, as it inevitably leads to a demise, but with age, a new layer of beauty unfolds. Seeing as change is the only constant, we may as well try to embrace it every step of the way and find something positive, even in tough circumstances. Every winter, locals anticipate an icy spectacle and this year it finally happened. Amsterdam's canals FROZE! For those of you who may have missed it, the city turned into a real-life snow globe for the first time since 2012. What a majestic sight! I watched and waited to find a good point of entry where I, reluctant at first, slowly and steadily, slid down onto the ice from the bank of the canal. Anxious, for both myself and my camera, it took a few nervous minutes to catch my bearings. Once the ice felt stable, my slow steps turned into more confident strides and soon enough I was loving it. Suddenly, I'd stepped into another world where walking on water was a reality, it was magical! Wheeee! I can't believe I'm jumping for joy in the middle of a frozen canal! A friendly stranger snapped the photo above and immersed in the moment, I did a gleeful, little hop in the air. So, there you have it. Eight years and endless memories along with the Prinsengracht—from the countless boat ride to canal side picnics and our annual Gay Pride parade—but this was definitely one of the most remarkable moments in my Amsterdam history. This weekend, I feel even more in love with my adopted city. I was in the action for about half an hour before my fingers went numb and I headed off to my last meeting of the day... only to return again later in the evening. By then, the frozen Prinsengracht had turned into a wild scene, complete with (frozen) boat parties, gluhwein and plenty of ice skaters. You're probably curious if people fell in. Well, of course, they did. However, that didn't dissuade the Dutch who love to skate, this was their moment to shine and on natural ice nonetheless! I love living in a city where it's socially acceptable to take a spin on the frozen canals. In fact, the city helped make this happen by closing off the canals during our week long freeze to encourage ice formation. I was a bit shocked to find a few of the self-made gluhwein stands (pictured below) had not really thought through the idea of stretching an electrical extension cord over ice which is of course bound to melt at some point. Ready for more? I sure was! Thinking back at this weekend, I still can't believe that I stood in the middle of a frozen canal and had the courage to face the cold and go back for more. The following day, I returned to our belved canals with my friend Bert to catch the action. I'm glad we did because the ice began to melt later in the afternoon and by Sunday, our ice walking fantasy had melted into history. Curious for more? Follow along with this story on instagram. I have a confession to make: having grown up surrounded by Florida’s scenic, tropical shores, I hardly frequent Dutch beaches… not even during the summer. As a true sun-lover, it's sometimes hard to grasp how I've even managed to survive the cold Dutch climate for eight years and counting. That said, I’d probably be crazy to visit the beach in the dead of winter. The way I see it, a beach trip without a bikini is blasphemy. Nonetheless, the beach is exactly where I ended up. Knowing that I’m never one to pass up a little adventure, my friends invited me for a walk along the shore and lured me with the promise of gezelligheid and a boozy, hot chocolate to warm up. With my scarf, mittens and my camera in tow, off we went on the train from Amsterdam to Zandvoort aan Zee. From there, we walked about four kilometers along the shore over to Bloemendaal. The beach was full of visitors walking their dogs and wind surfers in wet suits flying high before crashing into the waves. On dry land, the wind was cold enough to bring tears to my eyes and my fingers went numb more as soon as I could warm them. Even now, thinking of how cold that water must have been still makes me shudder! The moody overcast light, sea foam and misty horizon kept me entertained as I lagged behind our group, snapping photos and trying to adjust my camera settings with thick leather gloves on. Eventually, we arrived to the cafe for a well-deserved round of warm drinks and you can bet that I had my cocoa with an extra shot of bourbon and whipped cream. With the company of good friends and enough thick layers (and whiskey) to keep me warm, this skeptic survived a winter visit to the beach. However, when I popped back outside to capture the sunset a burst of frozen wind blew and I swear, the tear froze to my face. That’s the moment when our beach visit had me begging for the warmer breezes of home. Instead, I settled for a bubble bath back at my flat and made a resolution to visit the Dutch coast again some day. That is, if summer ever arrives—there's talk about the canals freezing over this year!